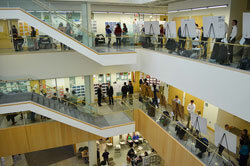 The annual BME 101 Poster Session was held this year on Friday, December 13th in Goergen Hall. This year, there were over sixty posters spread across the second and third floors. A brass ensemble and choir entertained attendees throughout the afternoon. Photos from the poster session can be seen on the BME facebook page.